Grades 3. 4. 5 - Click Here for paper to complete to put a message in the yearbook. Grade 6 - Click Here for paper to complete to put a baby picture & message in the yearbook. To prepare for the GRADE 6 field trip, please click HERE for important field trip information and directions. GW students received information to partipate in a Augustine's Pizza fundraiser. Order forms & money (cash only) are due 1/24/19. Pick up will be Tuesday, 2/5/19 in the GW cafeteria from 6:00PM-7:30PM. Questions, contact Mrs. Mangieri or Mrs. Girman. 724-656-4729. 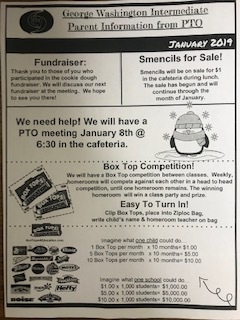 Click HERE for the GW PTO Newsletter that was sent home with students. Cookie Dough will be available for pickup from 3:30-4:30 on Wednesday, December 12th in the cafeteria. Thank you for participating! Questions? Please call Mrs. Mangieri (724)656-4729.